The Prime Minister promised to make a state of the art cultural centre and a digital museum for the region. LEH: Prime Minister Narendra Modi said on Saturday the people of Ladakh have set an example in human endeavour and urged for progress that must be followed by those living in Jammu and Kashmir regions. 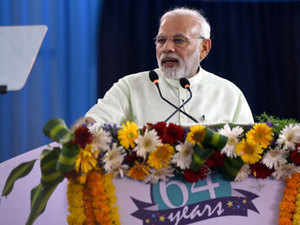 Speaking at the closing ceremony of centenary birth celebrations of the Buddhist spiritual leader, Kashuk Bakula here, Modi said: "Despite hardships and inaccessibility, Ladakhis have set up an example in endeavouring hardships and yet continuing their march of progress and development. This example will have to be followed by the people of the valley and the Jammu region." He said Ladakh today was a far cry from its past when it was known just for three things "totu" (pony) "sottu" (powdered corn) and "patu" (local tweed). "Your self-confidence has taken Ladakh to great heights from those days of backwardness. I am told today that the entrepreneurship of the women of Ladakh is an example for the rest of the country. "With a population of just a lakh and a quarter, the people of Ladakh host two lakh tourists each year." The Prime Minister started his speech in Ladakhi language as the gathering exploded with applause. "The region is not new to me. I have come here many times. When I worked for the party and visited Ladakh, my friends would ask me to bring some vegetables for them from Ladakh for the taste and purity of the local produce. He said Ladakh was an example of "great legacy of brotherhood and peace" and connecting people of the country with each other was Kushak Bakula's special attribute also known in far off Mangolia. Modi is visiting all the three regions of the state in a single day, during which, he said, he will inaugurate projects worth Rs 25,000 crore. The work on the Zojila tunnel -- connecting Srinagar with Kargil -- is starting. The tunnel will cost Rs 7809 crore. "Zojila is not just an infrastructure project. It is going to be technological marvel." He said he had asked Road, Transport and Highways Minister Nitin Gadkari to ensure that the project was completed in record time. He said the tunnel will give the region round the year connectivity with the rest of the country. "There is no better place for solar energy development in the county than the Ladakh regio n. Aromatic industry is developing fast in the world. There is a shift from chemical aroma to natural aroma. This industry has a great potential here. He promised to make a state of the art cultural centre and a digital museum for the region. "People want a medical college here. I have taken the demand seriously and I will ask the state and the central government to explore this possibility and furnish a report on setting up a medical college. Mother-In-Law Criticized Her For Not Cleaning. Her Son's R..